Have you ever wondered why every swimming pool is almost the same length? I am going to have to disappoint you and tell you that I don't know why that is. Someone probably came up with a standard that made sense and I guess it took off. 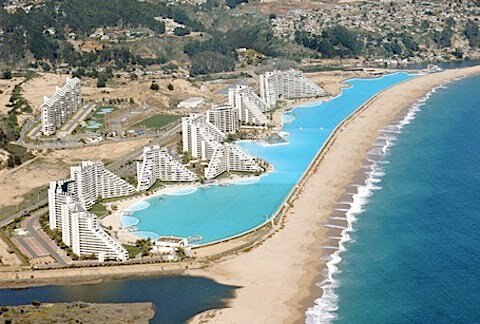 However, what I do know is that the largest swimming pool in the world is over 1km long and it is on a beach in San Alfonso del Mar resort at Algarrobo, on Chile's southern coast. 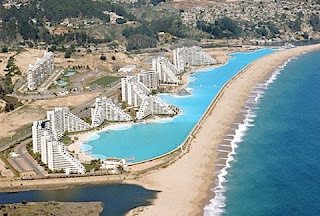 How would you like to swim in 1km long swimming pool? Talking about a perfect place to train for open water races. No pool walls to break your stroke cadence or your breathing rhythm, no waves to disturb you from keeping a perfect technique. You would also add a bit of a challenge to your swim by dodging kayaks or surfboards along the way. All that, in a 5 star resort right on the beach without the fear of the deep waters under you or some fish biting you on a leg :). After your 1 lap warm up in the pool (1km), you could just jump into the ocean for some more open water work or just a boogie boarding session and then back to the pool for warm down. For this type of swimming, you’d definitely want to bring the Swim Safety Device, if for nothing else, to at least store your stuff in the dry bag. And after a hard swim workout under the Chilean sun, why not enjoy a few of the world famous Chilean completos with a cold light beer (hmm, so good). If you are thinking that traveling to South America might be a bit dangerous, don’t scare yourself. 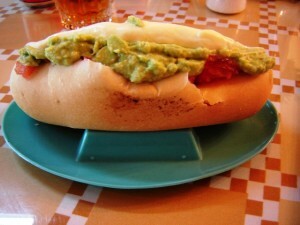 Chile is actually a quite developed country where there is no reason for you to feel unsave. I think it would be quite cool if they had some kind of a swimming or triathlon competition there in order to promote this extraordinary architectural wonder. And what would be the largest swimming pool in the world without the largest swimmer in the world. The largest swimmer is found in London right on the south bank of Thames, between the Tower Bridge and City Hall. The statue is partially immersed in the grass only displaying head, arm recovery, buttocks and foot above the ground. The largest swimmer statue is massive 10 meters long and in reality has nothing to do with swimming, but was erected to promote a tattoo TV show, London Ink. However, with the London 2012 Olympics coming soon, this could be the attraction to watch out for as swimming is one of the most prestigious events in the Olympics in general. Especially, if Ian Thorpe, one of Australia’s greatest athletes, comes back and faces of with Michael Phelps in one of the events. That could be a race of a lifetime to watch, but then again, there are very many fast swimmers in the Olympics, so we will have to wait and see. It now makes me wonder, what will Dubai do? Are they going to sit back and take the beating by the Chileans and British folks? Perhaps the world’s deepest pool or the world’s fastest pool is in order :). And why am I talking about the largest swimming pool and the largest swimmer on this blog. Well, sometimes, it is good to shift your focus on other things than just swimming with perfect technique and let you mind relax and recover. So next time you are swimming and you feel like it is not your day, why not just go to sauna or play in the water with bubble rings. You will not loose anything and more importantly you will feel better.